Arcam introduces Solo Neo with wireless streaming | What Hi-Fi? Revealed at CES 2010 in Las Vegas last week, the Solo Neo can stream numerous audio formats via wired or wireless Ethernet from NAS drives and other network storage devices, says Arcam. It also has a USB connection for playing digital content from a memory stick or an external hard drive. 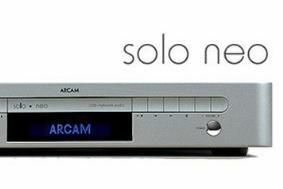 Arcam's Solo Neo is expected to go on sale in the second quarter of 2010. Find out more in our video report from CES 2010.